Our Abpromise guarantee covers the use of ab96718 in the following tested applications. WB 1/500 - 1/3000. Predicted molecular weight: 117 kDa. Addition of nucleotide-activated sugars directly onto the polypeptide through O-glycosidic linkage with the hydroxyl of serine or threonine. Mediates the O-glycosylation of MLL5 and HCFC1. Promotes proteolytic maturation of HCFC1. Highly expressed in pancreas and to a lesser extent in skeletal muscle, heart, brain and placenta. Present in trace amounts in lung and liver. Belongs to the O-GlcNAc transferase family. The TPR repeat domain mediates recognition of protein substrates. Ubiquitinated, leading to its proteasomal degradation. Cytoplasm. Nucleus. Mostly in the nucleus. Immunohistochemical analysis of paraffin-embedded Cal27 Xenograft, using ab96718 at 1/100 dilution. Immunoprecipitation analysis of OGT/O-linked N-Acetylglucosamine Transferase protein from A431 whole cell extracts using ab96718 (5µg). 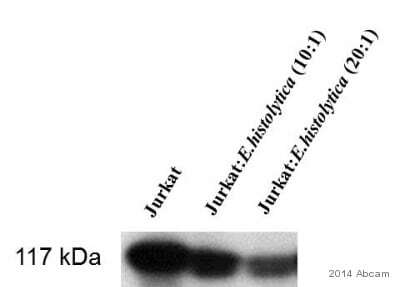 Western blot analysis was performed using ab96718 and an Easyblot anti-rabbit IgG was used as the secondary antibody. Ab96718 staining OGT / O-Linked N-Acetylglucosamine Transferase in MCF7 cells by ICC/IF (Immunocytochemistry/Immunofluorescence). MFC7 cells were fixed with paraformaldehyde at room temperature for 15 minutes. Samples were incubated with primary antibody at a 1:500 dilution. ICC/IF image of ab96718 stained DU145 cells. 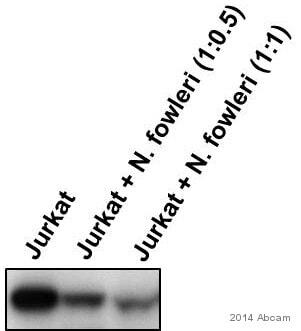 The cells were 4% paraformaldehyde fixed (10 min) and then incubated in 1%BSA / 10% normal goat serum / 0.3M glycine in 0.1% PBS-Tween for 1h to permeabilise the cells and block non-specific protein-protein interactions. The cells were then incubated with the antibody (ab96718, 1µg/ml) overnight at +4°C. The secondary antibody (green) was ab96899, DyLight® 488 goat anti-rabbit IgG (H+L) used at a 1/250 dilution for 1h. Alexa Fluor® 594 WGA was used to label plasma membranes (red) at a 1/200 dilution for 1h. DAPI was used to stain the cell nuclei (blue) at a concentration of 1.43µM. 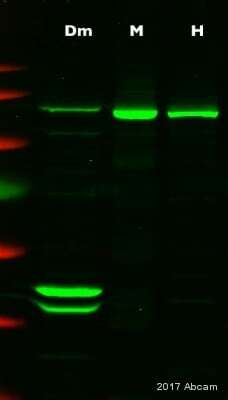 Publishing research using ab96718? Please let us know so that we can cite the reference in this datasheet.